Free fractions practice worksheets can help you teach one of the hardest math concepts to young learners. Fractions lay the groundwork for solving equations in the future. Read on to find out where to find great worksheets that will help your young learners master fractions. Math Drills - probably the ultimate worksheet website for teaching math skills. Download worksheets on fractions and virtually any other math topic. This site also offers seasonal worksheets. 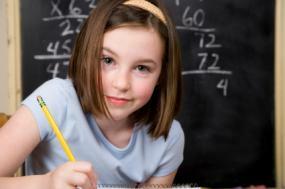 Homeschool Math - designed especially for homeschool students, this website has plenty to offer for math students. Choose by level of difficulty or simply choose the free fractions practice worksheets that fit your student's specific needs. Helping With Math - offers worksheets to help with every aspect math for fifth and sixth grades. This site has dozens of fractions worksheets to download that will help with teaching fractions. Jamit - select your fraction topic and print off your worksheet. Choose from equivalent fractions, improper fractions, mixed fractions and more. This site also offers a fraction worksheet generator so you may create your own worksheets for the classroom. Ed Helper - this site offers hundreds of worksheets on fractions and just as many for other math topics. Ed Helper also has a variety of puzzles to help teach beginning fractions to young learners. This site has worksheets for all grade levels. School Family - this site offers a variety of fractions worksheets from grocery math to mixed fractions. Adobe Reader is required to download and read the worksheets. Curriki - download free fractions worksheets that have been created by teachers. This site also includes math resources, additional activities and lesson plans. Math Expression - this website offers fractions worksheets as well as complete lesson plans for each fraction topic. Answer keys are provided with each downloadable worksheet. School House Tech - this site provides free downloads of fraction and other math topic worksheets if you have Adobe Reader installed on your computer. This site also provides a separate downloadable answer key for all of the worksheets. Grade A Math Help - offers dozens of downloadable fractions worksheets if you have Adobe Reader installed on your computer. Choose from addition, subtraction, multiplication and division of fractions. This site also has operations worksheets to practice all fraction skills. There are many other math websites that offer free fractions worksheets on the Internet, many of which also offer interactive online practice and tests. Use your computer's search engine to locate these additional free resources for teaching your homeschool math class.